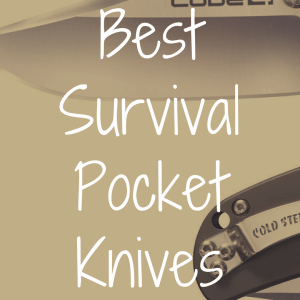 You are here: Home / Pocket Knife / What’s the Best Serrated Knife for EDC? While the debate over serrated versus plain-edged knives rages across the everyday carry (EDC) community, there are good reasons to use a serrated blade for your EDC knife. 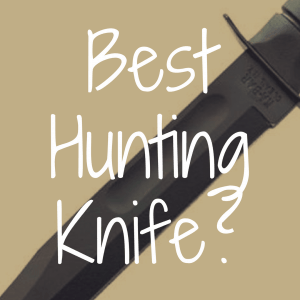 In this article, we’ll talk about what features to look for in a serrated knife, then discuss five amazing serrated knives that are worth considering if you’re strongly interested in acquiring a new everyday carry blade. And, to better help you narrow down your choices, we’ve compiled a great list (in the table below) of serrated pocket knives—many of which we will be discussing in depth in today’s article. The debate over plain-edged versus serrated-edged knives primarily deals with the maintenance involved in the care for each type of knife along with the relative ease with which serrated blades can make the pushing cuts needed for finesse work. An additional point, from the military and tactical side of the house, that serrated blades do move freely through tissue during combat (although one wonders how this is a common concern for people). The concern regarding the maintenance of serrated knives comes from the fact that sharpening serrated knives requires the painstaking filing of individual serrations. A plain-edged knife, conversely, allows for the sharpening of the entire blade at once. A serrated blade has distinct advantages, particularly for those that use their knives primarily with ropes, lines, and fabrics. Serrated folding knives developed in response to the needs of adventure sports, such as kayaking, sailing, and climbing. In the harsh conditions of kayaking Class IV rapids or sailing through a squall in the middle of the Pacific, kayakers and sailors needed knives that could quickly free them from their lines in the event they capsized. any design flaws that may make a knife less usable. 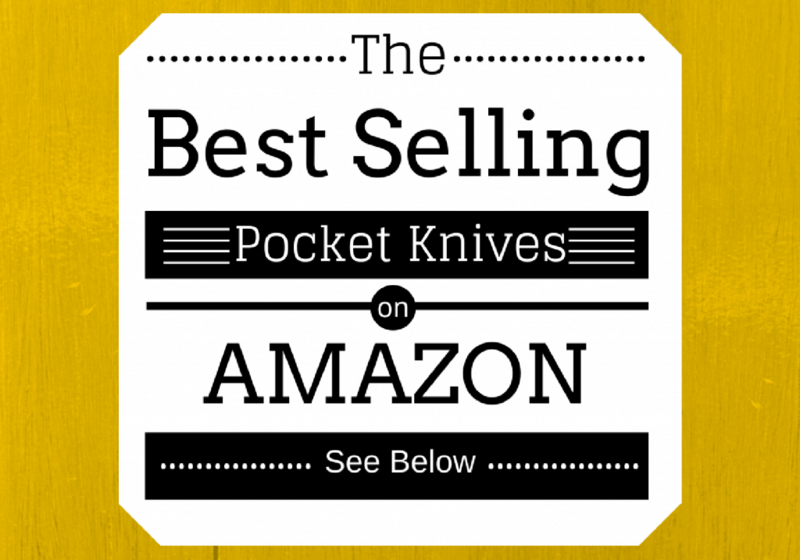 Below, please take a moment to view some of the best-selling pocket knives currently on sale at Amazon. Let’s begin with the SOG Trident. SOG’s Trident family of knives comes in three variants: (1) the fixed-blade “Trident 2.0;” (2) a larger-sized folding knife, the “Trident” and “Trident Elite” (which are nearly identical); and the smaller “Trident Mini.” While the fixed-blade Trident 2.0 combat knife only comes in a straight-edged model, the Trident/Trident Elite and the Trident Mini are available with straight-edged blades or combination straight-edge/serrated blades. The Trident and Trident Mini use SOG’s “SOG Assisted Technology,” meaning the blade springs open when triggered, but also has a safety on it that prevents accidental opening. The Trident has a glass-reinforced nylon body that is exceptionally durable and lightweight, and, unlike a metal handle, will not get slippery in inclement weather. Additionally, the Trident’s body is uniquely designed to reflect the first responder roots of serrated knives, with a notch designed to aid in rapid seatbelt cutting. The Trident blades are clip point blades, which makes them outstanding knives for both utility purposes and tactical purposes. SOG is known for using AUS–8, a mid-grade Japanese alloy comparable to 440C steel which is tough and easy to sharpen. However, the alloy may not hold its edge as long as other steel alloys. The Trident knives are no exception. The blade of the larger variant of the Trident knife is 3.75 inches long, that of the Trident Elite is 3.7 inches long, and the blade on the Trident Mini is 3.15 inches long. The Trident blade has an ambidextrous thumb stud for opening the knife, something lefties like myself appreciate. If there are any complaints about the Trident, it would be that the assisted opening mechanism seems stiff and somewhat hard to close compared to other assisted-opening knives. While I have no complaints about the safety feature on the Trident, this may be a bit of an extraneous feature. Spyderco pocket knives could be considered the benchmark of serrated pocket knives, and the Delica is a classic example. Spyderco has been manufacturing the Delica for decades and has not changed its design to any significant degree. alternative materials used in the handle of the knife. You can read our review of the Spydero Delica 4 here! True to the spirit of Spyderco’s founder, each variation of the Delica seems to be the result of a never-satisfied tinkerer at play in a knife factory. The Spyderco Delica is a manually opened knife, utilizing a unique thumb hole in the blade as a pivot point for fast opening of the knife, with or without gloves (I have operated my Delica with tactical gloves and while whitewater canoeing). The Delica is available with three different handle materials: titanium, stainless steel, and fiberglass-reinforced nylon. While others may prefer the appearance of the titanium or stainless steel handles, I believe the nylon handle is easier to grip in rough conditions, such as while on the water or in stormy weather, both due to the non-slip nature of the texture of the handle, seemingly modeled on the high traction waffle patterns of running shoes. Another additional feature on the Delica body that should be appreciated is that the knife’s clip is removable and capable of being attached to multiple locations on the handle, allowing someone to customize the knife based on how and where the users like to carry it. Unlike the SOG, which uses AUS–8 steel, Spyderco uses a vanadium/gold/steel alloy known as VG–10. VG–10 is a strong, sharp steel alloy, and is also very corrosion-resistant, due to the way vanadium bonds with the carbon in steel. For fishing hobbyists or those who works in a humid environment, this corrosion resistance makes the Spyderco Delica particularly appealing. Spyderco keeps the core engineering of its knives very simple, perhaps wisely, as there are few major complaints about the design of their knives. Because Spyderco has a traditional unlocking mechanism on the Delica, two hands would most likely be required (barring some serious dexterity) to close the knife, something unnecessary with the design of the SOG Trident. Additionally, some have reported milling issues with the thumb hole on the Delica that would make opening the knife unpleasant without repair. CRKT is the only manufacturer in this list that is utilizing a unique design for its serrations, breaking from the traditional model of alternating large and small scallop serrations and instead using an angled “Veff serration.” The Ignitor and Ignitor T (the T indicates that this is the tactical variant of this knife) appear to be lower cost alternatives to the Benchmade Griptillian. CRKT utilizes a G10 fiberglass composite material for the handle of the knife, which makes it slip-resistant and durable in harsh conditions. Further improving the grip of this knife is a deep finger guard, which would assist in the tactical use of the knife. However, the knife could use a more defined hilt, something CRKT itself has recognized in the design of its M–16 line of knives. CRKT has utilized the sturdy 8Cr14MoV, 56–59 HRC alloy for the blade. 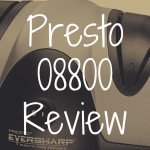 While this makes the blade somewhat harder to sharpen, it means that the blade will retain its edge longer. The knife has a practical drop-point design, and the Veff serrations appear to be designed to better handle ropes and lines than the traditional straight-on angle of regular serrated blades. There do not seem to be significant flaws with the knife’s designs other than the absence of a more prominent hilt to protect the fingers in combat applications. One aspect of the knife that seems unnecessarily complicated is the Fire Safe mechanism used to unlock the knife. 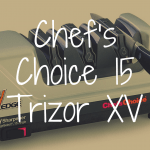 Much like the unnecessary safety device mentioned above concerning the Trident, the Ignitor T requires the user to depress the thumb stud on the blade before opening the knife. Additionally, the Fire Safe mechanism means that the knife is not truly ambidextrous, something that may frustrate left-handed users. Overall, though, this is a solid knife with practical design elements, consistent with CRKT’s other knives. While it may seem unusual to include a multi-tool in a list composed of EDC and tactical knives, the Leatherman Skeletool is a less-bulky, better-designed multi-tool than the cumbersome bricks that most multi-tools seem to be. Like the Spyderco Delica, the Skeletool boasts some variants that address the needs of different users, from the Skeletool RX for EMTs and first responders, the carbon fiber body Skeletool CX intended for light hikers, the Skeletool SX for snowboarders, along with the core Skeletool model. With the Skeletool, Leatherman moved away from the traditional folding-block model of a multi-tool, stripping away unnecessary metal and giving the tool a more ergonomic form factor. Compared to the Leatherman Wave, which weighs 8.5 ounces, the Skeletool is nearly half as heavy, at 5 ounces (granted, this comes with having seven features to the 17 features boasted by the Wave). The Skeletool has a solid metal body, which could cause some slipperiness in wet conditions that Leatherman has tried to reduce with cutaways in the handle. The Skeletool handle also has a carabiner attachment that can be used to secure the tool to pants or a backpack, along with an adjustable pocket clip. Like the Delica, the Skeletool relies on a thumb hole opening for single-handed operation of this manual lock blade knife. The classic Skeletool and Skeletool SX have partially serrated blades, and the rescue-oriented Skeletool RX has a fully serrated blade, perfect for cutting through seat belts, ropes, and nylon webbing. 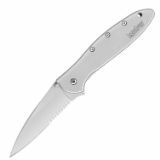 The Ontario Knife RAT–1 is the most price conscious option in this list, currently retailing for less than $30.00, and that price point provides a substantial basis for this knife being on the list. The RAT–1 is a bargain knife that offers more than its price would lead one to expect. The RAT–1’s handle is made of nylon with a deep finger pocket (the choil, for those that prefer the obscure term) to protect against slipping. While the nylon is more slip-resistant than stainless steel handles, the mild pattern on the nylon does little to improve the grip of this knife. The handle is connected to the blade in an unusual swept-back alignment that leads to a sizeable gap (roughly one inch) between the actual blade and the handle. Not only does this seem like wasted space according to some reviewers, but I believe it also contributes to the knife not always opening all the way when deployed with a single hand (unless I have unusually short thumbs). The RAT–1 utilizes inexpensive, mid-range AUS–8 steel, which is not the best for blade retention, but very easy to sharpen. 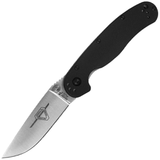 Technically a drop point knife, the RAT–1’s blade is more akin to a cutlery blade than a tactical drop point. The blade’s design may reflect the utilitarian intent behind the knife. Unlike other manufacturers, Ontario Knife chose to go with uniform small serrations in this partially serrated blade, which may be more practical when dealing with rough ropes and other materials. 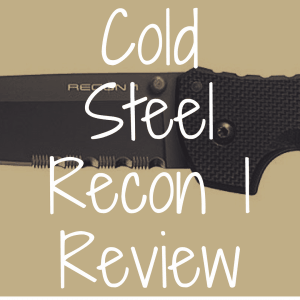 Regardless of the flaws mentioned above, this remains an excellent inexpensive tactical serrated folding knife. 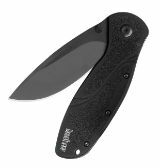 Additionally, the knife is a favorite of those who like to mod their knives with different scales (handles) or blades, so this may be the perfect folding knife for the tinkerer. 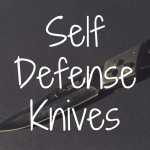 What Are the Best Self Defense Knives?